Provide comfort for the family of Michael Colston with a meaningful gesture of sympathy. Michael Claude Colston, age 69 of Baldwin, passed away on Sunday, February 10, 2019. Born in Clarkesville, Georgia on November 12, 1949 to the late Claude and Estelle Dixon Colston. Mr. Colston proudly served his country in the United States Navy, stationed in Sicily, Italy during the Vietnam Era. 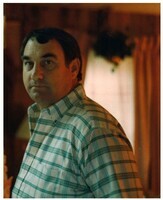 He was employed for many years with Patterson Pump and also taught welding at North Georgia Technical College. Mr. Colston was also an electrician and a brick mason. He was an aviation mechanic for the Blue Angels. Mr. Colston coached basketball for the Habersham Rec. Department and enjoyed riding motorcycles and hunting. He was a member of Providence Baptist Church where he served as a deacon for almost 40 years. Surviving are his daughters and sons-in-law, Michelle & Ritch Wilbanks of Clarkesville and Misty & Jason Bull of Lula; brother & sister-in-law, Jim & Dianne Colston of Demorest; sister and brother-in-law, Carol & Roger Willis of Clarkesville; grandchildren, Cole, Jess & Cannon Wilbanks and Caroline & AliJay Bull; numerous nieces, nephews, other relatives and friends. Funeral services are scheduled for 4 pm, Wednesday, February 13, 2019 in the Chapel of McGahee-Griffin and Stewart with Pastor Shane Jenkins officiating. Interment will follow in Victory Baptist Church Cemetery with full military honors provided by the United States Navy and the Grant Reeves VFW Post #7720, Habersham American Legion Post #84, & the Rabun County D.A.V. Chapter #15. The family will receive friends from 1 pm until the service hour on Wednesday at the funeral home. Flowers are accepted or donations may be made to Victory Baptist Church, Building Fund, 1094 Hwy. 17, Clarkesville, GA 30523. MCGAHEE-GRIFFIN & STEWART FUNERAL HOME OF CORNELIA, GEORGIA (706/778-8668) IS IN CHARGE OF ARRANGEMENTS. To send flowers in memory of Michael Claude Colston, please visit our Heartfelt Sympathies Store. Consider providing a gift of comfort for the family of Michael Colston by sending flowers. Provide comfort for the family of Michael Claude Colston by sending flowers. mike is my first cousin and a wonderful human being. when I read his obituary I wasn’t surprised at all of his many accomplishments. a life to be proud of.